Our journey is ended, and with much success. We left Bangalore around 2am Saturday morning (6/30) and arrived into Dulles around 12:30pm the same day. Ok, so that's local time in both cases, but talk about trippy. I went approximately 40 hours between showers (ew!) and only slept a few hours on the first leg to Frankfurt. To say the least, I'm quite tired. Continue reading In a Word: Exhausted (Bangalore Series Concludes). Question: How do you ensure that men will buy lots of items at a clothing store (womens, mens, kids)? We visited Naina Sarees ("Your dream saree destination") on the (excruciatingly long) drive back to the apartment tonight. It was a very nice store, but my gosh did they have the formula down just right, at least in terms of us clueless Americans (and one Scot). I got out relatively unscathed, but I feel for my companions. It was darned near impossible to say no to these relentless beauties. Continue reading Five Down, One To Go (The Bangalore Series). Well, yesterday was a full day. Most of the cool things that occurred were work-related, so nothing I can talk about here. So, instead, I'm going to talk about food and conveniences. No, I have not had any "issues" with the food that would lead to abnormal use of conveniences. Rather, they're different here, warranting description (I think, anyway). 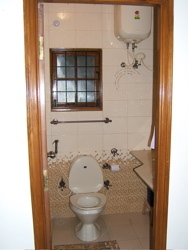 So, the picture here on the left is of my private bathroom in the apartment. There's a shower on the right, behind the door, which you can't see. On right is sink with a somewhat unusual fixture (will post it to my photos site later). That box on the wall in the upper right corner is the water heater. Each bathroom in the apartment has one. Continue reading Bangalore: Day 4 Recap (food! ), Day 5 Underway. Pardon me while I diverge from my travelogue for a moment to point out a couple articles demonstrating pure idiocy, first on the part of politicians, and second on the part of "security experts" mindlessly saying that something "might" be possible instead of pressing a more likely scenario. Continue reading Security Idiocy: Politicians, Mobiles. We're having an absolutely fabulous time here in Bangalore this week. Today, I think, has been the best day so far. First, folks were much more relaxed in the training (both presenters and attendees), so that made a marvelous difference. We were told that word of mouth is getting the message out about the training such that everyone wants to attend. But, behind the work, it was just a good day for meeting people, having good discussions on how I can help them, what they think about the future of the company, and so on. Continue reading Bangalore, The Third (day). Bangalore, Day 2: No Free Lunch! We're through our second day in Bangalore and our first business day. We met our host, Amitabha, at BDC around 9am this morning. Overall, we delivered 4 training sessions. I also met briefly with a dev VP, which turned out to be a pre-meeting meeting. There's really not a whole lot to speak about today. Everything went smoothly, we had fun counting colloquialisms spoken by each other during the training, and so on. 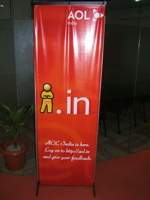 At right is a picture of the launch banner for the AOL India portal. This launch was a major event, covered in the media with AOL President Ron Grant visiting. The headlines and photos reminded me of the stories one reads about General McCarthur in Japan after WWII. Continue reading Bangalore, Day 2: No Free Lunch!. Today was our first full day in this crazy place called Bangalore. We took advantage of our transition day to get out and explore the city, and I think it's safe to say that we had a very good time. As mentioned earlier, we slept in a bit this morning, so didn't get a start on the touristing until afternoon. This was fine by me. 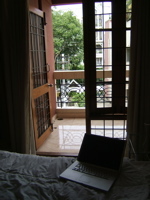 Continue reading Day 1 Complete: Exploring Bangalore. We arrived in Bangalore early in the morning Sunday (our flight a little behind schedule). It was quite the scene at the airport. Getting through customs was a breeze (we wondered what the point was, even) and two of us were able to get our luggage without a problem. Ian's checked bag took much longer and we started to wonder if he was going to make it out of the airport or not. Eventually he got it and we were good to go. As we walked out the door of the airport, we were greeted by a throng of people - drivers, as it turns out - holding signs with names. It turns out, finding our sign, while not difficult, was also not trivial. I should mention that simply getting out the door was an exercise in "no, thank you" as we were each approached multiple times by guys offering to carry our bags, taxi for us, etc. 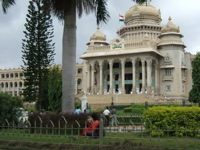 Continue reading First Impressions: Bangalore, India. Continue reading Sick of A**holes. Just wanted to jot off a quick note. The recent line silence is due to an up-tick in workload in preparation for heading East to Bangalore, India, the end of the week. I'll be meeting with dev and ops folks in our offices over there, as well as delivering security awareness training as needed. As a result, I've been cramming hard to get as much outstanding work cleared as possible. In addition to the trip, my parents are flying in on 6/30 (literally scheduled to come in about 6 hours after I get back) in order to go enjoy the Capitol Fourth on the National Mall. Sooo.... don't be surprised if there are very few updates from me between now and then, with a possible exception of posting a couple quick pics from my ongoing trip. Continue reading Quick Update: A Head-Down Week. Bruce Schneier has posted a recent Wired essay he wrote titled "Portrait of the Modern Terrorist as an Idiot" in which he urges us all to be skeptical of what we hear from the media and government, particularly with regards to so-called "terrorist" plots. He looks at the fear-mongering tactics used to push political agendas when these so-called "terrorists" are nothing more than a bunch of drooling idiots who are haphazardly trying to create a stupid idea. This concept of skepticism is actually a very valuable thing to develop. CIO magazine recently had an article on "How the Elite Innovate" that talked, also, about being skeptical. Instead of being silent followers of all changes, we should instead think critically, asking hard questions, behaving in a manner that challenges change to make sure that it is, in fact, the right thing to do. Continue reading Schneier: Be a Skeptic. Grab Bag: Farewell RTC, Dobbs on CNN.com, etc. - India trip coming up quick! Continue reading Grab Bag: Farewell RTC, Dobbs on CNN.com, etc.. I've been feeling fat lately. Not sure why. Maybe it's because my weight is up, even though that's likely attributable to my increased strength (see my recent post). Nonetheless, I feel kind of pudgy, so I decided I needed to kick the lagging cardio back up into overdrive. So, today I did a 5-mile run (slash walk). It actually went fairly well, though my legs are starting to kill me now. Most impressive, I think, was that I was able to jog the last mile in almost its entirety (stopped to walk for about 15 seconds to let a car turn). So, that's pretty good, I think. I need to go get a banana now before my legs cramp up (I've already had my Endurox R4). Continue reading A Good Last Mile (and a half). Uh... straw poll: who thinks the USA government is owned by the President? For some odd reason, I have this strange belief - maybe coming from a fuzzy recollection of that old rag, The Constitution - that starts "We the people...." Yeah, I must be deranged. I could have sworn these elected officials were supposed to be representing the people. Silly me. Pavel Power for New PRs! As mentioned recently, I'm officially on the Pavel bandwagon. Today, about a week into things, I noticed my first major gains. Just a few weeks ago, I put up some new personal records (PRs) in my last trainer-led lower body session. At that time, I knew that I could do more than 325 lbs on squats, but didn't make any further attempts. I did, however, have trouble at 700 lbs on the leg press. Well, after just a week of Pavel's "Power to the People" workout, I can honestly say that 700 lbs does not trouble me any more. Continue reading Pavel Power for New PRs!. Well, thank goodness, sanity and justice has prevailed. A hearty shout out to Superior Court Judge Michael T. Sauer for putting the spoiled brat crybaby Hilton where she belongs: behind bars. This is a textbook case of someone believing they were an elite untouchable who was above the law. I'm distinctly impressed that this judge made the decision to not give in to what is clearly an attempt at manipulating the situation because she could not accept the consequences of her actions. This makes two victories for justice and fairness this week, with the other being the tossing out of the original case against Julie Amero. It's encouraging to see the courts doing the right thing for twice. Continue reading Justice Served for Crybaby Hilton. Continue reading And Yet Another Indication the Models Are Wrong. Officially on the Pavel Bandwagon! I've just finished my first official Pavel workout - and it rocked! I recently purchased three of his books (Power to the People! : Russian Strength Training Secrets for Every American , The Naked Warrior , and Relax into Stretch : Instant Flexibility Through Mastering Muscle Tension ), which arrived late last week. I've now read through most of all three (well, ok, read Power, skimmed Naked Warrior and Relax). Last night I tried a few of the stretches in Relax and was quite pleased. Today I did the recommended Power 2-exercise program and felt great. I still have to work on form a bit more, but while practicing with my trainer buddy on deadlifts, I was able to put up 225 lbs without much trouble. I need to do a lot of work with the side presses, but then my upper body is behind my lower on strength. Anyway, I highly recommended Pavel's works! The strength program, the bodyweight-only program (great for traveling! ), the stretching, and - of course - the kettlebells! I do not have personal experience (yet) with KBs, but 2 friends are using them now and loving them. It's on my list for starting in the Fall. Get to it! Oh, and ladies -- Pavel's program provides real strength and toning without adding mass! Continue reading Officially on the Pavel Bandwagon!. According to ecogeek, Acumentrics Corporation has developed a new fuel cell that works with multiple fuel types and allows generators to run twice as efficient. This method is ideal for folks living off the grid. Continue reading Cool New Fuel Cell Technology. Bruce Schneier has posted an essay from Jan 2005 on Cyberwar that is fairly interesting. It's an interesting contrast to Marcus Ranum's comments in his book The Myth of Homeland Security. What do you think? Continue reading Schneier on Cyberwar. I've recently completed Robert Cialdini's Influence: The Psychology of Persuasion (Collins Business Essentials) . The book covers in detail what Cialdini has identified as the six most common methods of influence that are used or abused in compliance situations. A compliance situation would be any scenario where someone is trying to get something from someone else, either for themselves or their organization. Each of the six methods has its own chapter, which provides copious anecdotal and academic backing. This work fascinated me from an information security perspective. One of the primary threats to average users today is from phishing and spam, which often lead to various types of fraud. These attack vectors often leverage one or more of the six methods, as I'll describe below. Following are my notes from the reading, with additional thoughts and anecdotes added as applicable. Continue reading Notes on Cialdini's Influence. The Bruce has a couple excellent posts on his blog this week. The first informs us of a TRAC report criticizing the DHS' lack of focus on terrorism. The second is an essay he wrote for Wired titled "Tactics, Targets, and Objectives" that touches on TSA, but really goes broader on the topic. The essay is very informative, I think, and definitely worth the read. I don't have any commentary really to add. I'll be generating some new original content here over the weekend -- once I get my feet back under me from the break-neck pace of work these last couple weeks. Continue reading TRAC DHS Report, Schneier Essay.